As you can probably imagine, my Dad was a bit of a stickler for lifejackets. If you are on the water, was his view, then you should be wearing a lifejacket. And you should not just be wearing it. You should look after it. You should maintain it in good working condition. And you should know how to use it. Now, when I was a kid, we didn’t have the rather nice, stylish, self-inflating lifejackets that we all use today. So I was generally to be found sporting this bright orange, foam-filled monstrosity that easily doubled my girth and made it virtually impossible for me to approach within a couple of feet of anything. In short, it was horrible. But it was my lifejacket, and therefore my responsibility. So I looked after this pug-ugly thing like it was part of the crown jewels. I cleaned it after I’d been in the sea, I hung it up to dry and I checked the various parts regularly (especially the whistle, much to my parents’ annoyance). Thankfully, just as I was entering my more style-conscious teenage years (anyone who knew me back then will appreciate that I’m being more than a little ironic here), the modern CO2 lifejackets started to come onto the market. And given my Dad’s interest in such things, it wasn’t long before we were all kitted out in them. In fact, my Dad quickly became a guru in all things relating to lifejackets. He was determined that the RNLI’s lifeboat crews would have the very best protective equipment that was available, so our living room would invariably be full of all kinds of lifejackets on loan from their manufacturers. The upshot of all of this is that I, too, am now a bit of a stickler for lifejackets. Because they really are essential kit for anyone on the water. Your lifejacket will help to keep you calm. It will help to keep you afloat. And if things get really bad, it will help to keep you alive. You only have to do one thing. You have to put it on. 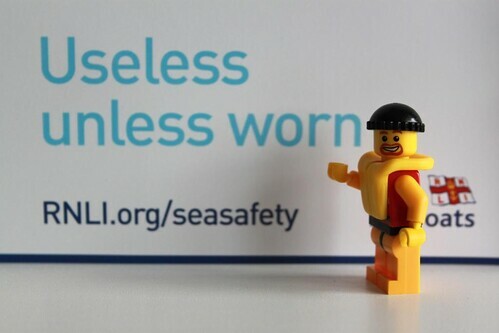 This entry was posted in Stories from the past and tagged Lifeboats, Lifejackets, RNLI, The Lifeboat Crew, Useless Unless Worn by Simon Perks. Bookmark the permalink.